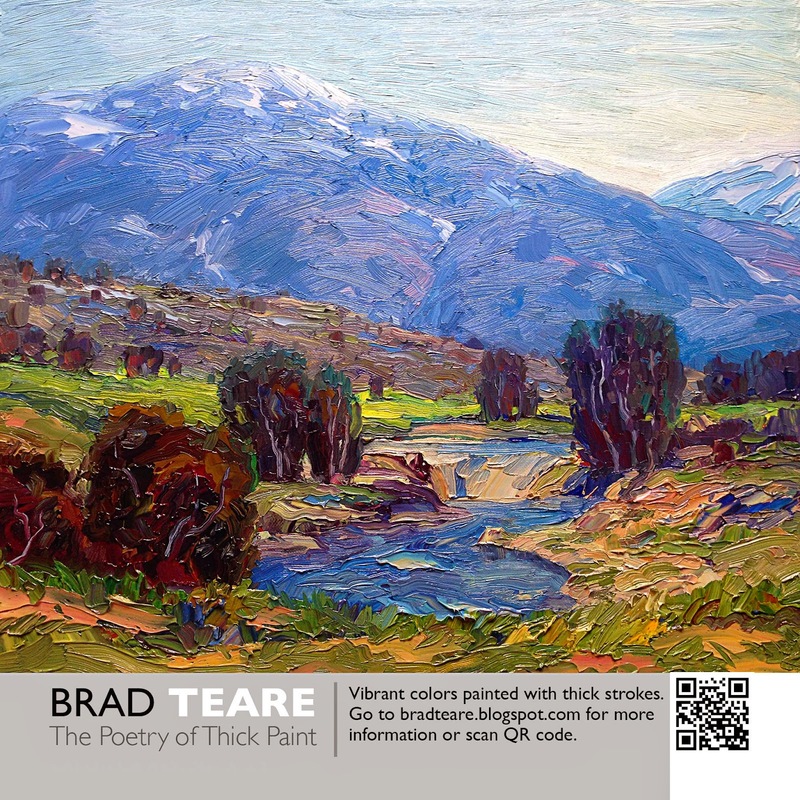 BRAD TEARE: 163 Why collect art? The deadline for my ad for the Door County Plein Air Festival booklet is at hand. Once again I feel inadequate to describe why potential collectors should buy my paintings. I believe in my artistic project but how do I communicate that passion to collectors? Via the ad I have an opportunity to connect with potential collectors beyond simply showing paintings at the central venue during the festival. Everyone will get a booklet and a chance to see my ad. It's an opportunity to tell my story to many people in a way I probably won't be able to do on an individual basis. As you can see in the accompanying image I chickened out and let my painting do the talking—although in conjunction with the ad I plan to write a compelling blog entry I hope some will read via the QR code. In the entry I will elaborate my painting philosophy, mention a few prestigious venues where my art has been seen, and add a photo so festival goers will recognize me. But will the QR link make connections not made with the ad? The inability to effectively connect with buyers is a traditional struggle for artists. Many–including myself—wish for a world where we wouldn't have to actively sell our work. But in yearning for a different world we miss a salient point—artists must provide compelling reasons to collect our work. Art is communication and the responsibility for clear communication sits squarely on our shoulders. Yet when it is time to write ad copy for my own ads I'm still at a loss to describe why potential collectors are enriched by buying my paintings. Many assume the sole reasons for purchasing paintings are the visual aspects of the painting itself. But we fail as artists when we can't communicate why collectors should hang original art on the walls of their homes. Perhaps it's time to collectively articulate the unspoken, intuitive reasons to collect art. Brad...it is an ongoing question, why buy art? I don't know either. If I wasn't a painter, would I buy paintings? I think I would, but can't swear to it. My pictures are stacking up like dead mackerels. I keep lowering my prices but that doesn't seem to be working. At some point if the price gets too low then the paintings become devalued in the viewer's eye. They will think: " Well, if it's that cheap, it must not be any good." Where's the line? I have refused so far to go the giclee print route of making inexpensive repoductions of my work. I don't paint from photographs, don't make copies of my original works, so am I 'painting myself into a corner'? Probably. But my belief is that the world is stuffed with images, people can make their own photo prints at home easily now, so authentic art should be given an even higher value. But the awareness of what's original and what is a copy is at a very low ebb among the general public. They don't care. So I paint in a vacuum. I've always made custom frames for my pictures, thinking that this extra homemade quality was special and would make my work even more one-of-a-kind. But as Victor Borge used to say: " If you've only got one, how can you have a kind?" I live on a low retirement income and don't depend on art sales but man it would be nice to at least pay for the art supplies. And I'd love to move my paintings out into the world, rather than having them pile up in corners and closets at home. It's crazy. I'm painting smaller, thinner, cheaper,...but it's not happening. Of course I've honestly faced the fact that my work isn't good enough to sell; what artist hasn't done that? But I think it is good, not masterpieces that will go down in history, but worked-out, lived-through, accomplished , and authentic art. No takers. There are about five people on earth who care about my painting, five fans who appreciate the journey I've been on for decades. That's my audience, and I'm very grateful for them. But I need to sell something to keep the process moving forward. It's like the old Adlai Stevenson quote, when a supporter said to him: " Senator, all thinking people will vote for you" he replied: " Thank you madam but I need a majority." Obviously I can make compromises in the way I work. I haven't succumbed to copying yet, but I understand that most viewers like my painting best in the beginning stages when the work is full excitement and still has lots of bold brushstrokes. They usually mourn the loss of freshness due to the many compositional changes I tend to make. So I'm trying my best to stop my work in progress at the more acceptable stage. That feels like a huge compromise to me, but one I'm willing to make because it's still true work, still honest work, still authentic work. It just isn't finished in my mind. This is a recent change in method and the jury's still out about how the work will be evaluated in an upcoming show. But if this 'new style' doesn't appeal to anyone enough to buy something then I might as well just work on one painting for rest of my life, continually changing it just for the sake of changing it. Is this your website? : http://www.persimmons.net/Images/Steve-Ladd/Steve-Ladd-Bio.pdf I identify completely with your statement. If you have a small pension you are doing better than most artists, so that is awesome. I'm going to make an entry that is all about reasons for collectors to buy art and support artists. I hope to get some ideas via these comments. One problem obviously is that very few people really like art. Or not as much as they like snow mobiles, boats, RVs, etc. We need to find reasons to buy art and communicate them effectively. No, that's not my website, it's a local art gallery/café where I had a show about 4 years ago. The town paper did an interview with me and that's probably what you found online. I don't have a website, though I've done research on how to do it, even joining a community art site where the artists have their own gallery. But I had to give up the idea when I was told by the creators of the site that all my works have to be pre-priced with the cost of shipping and handling stated ahead of time. That seemed crazy to me, how could I know how much a painting is going to weigh or what the postage-to-destination would cost? I'd have to make all my pieces the same size and have a shipping & receiving room in my house with all the packing materials on hand and know just how much carboard, bubble wrap, was to be used. Impossible, at least for me. I got out of the site and let go of the idea for my own online painting site. Since that Persimmons show, I have made a concerted effort to change the way , and the subject matter, of what I paint. I'm concentrating on smaller landscape oils on canvas panel, because they are thin and light weight. Landscapes because that's what people want, they aren't interested in portraits or figures. I used to have a facility for drawing the figure but I'm losing that skill with the emphasis on landscapes. I'm also trying to paint faster, finish a work in one or two settings. That's harder for me to pull off because I never paint anything right the first time and have always relied on fixing what's wrong in a picture, which takes time. I have done one piece lately that was a success after only one day's work. If I can do a few of these and frame them more simply, then I can lower my price quite a bit. But, as I said, I'm reaching the limit of compromise, and if this doesn't make a difference, then I'm stymied. I very much like your proposal to explore the reasons why people should buy art. That is an important path to go on. A close friend , who is a musician/ artist believes that there is a middle class market for original paintings, folks who don't want posters on their walls and are willing to spend a few hundred dollars for something they like. These people would not be collectors of art, just plain folks with some sense of taste and appreciation. But I'm not seein' it Brad. What I witness are people who are willing to spend a few hundred on a new camera, or on a concert ticket, or football game, or even a bottle of fine wine!... but not on a painting. This friend of mine says that he doesn't like people-pictures because he doesn't know the people. Amazing. But he's not alone in his assessment, that's how most folks feel now. It's like we're in for a thousand years of landscape painting. I like landscapes but sometimes I get the feeling that the big one has hit and all the people are gone. Just empty streets, vacant meadows, lonesome valleys, vacant buildings. That's okay, I can go there too and am going there. But I don't think the public wants to buy landscapes, they just want to look at them for two seconds and move on to the wine tasting and gossip. So here's what I can try to do: paint pictures that are beautiful to me in the hopes that they will be beautiful to others, beautiful enough to want to have in their homes. Can I do that? Can I do that and still retain some integrity and creativity? I think your luscious landscapes are a good solution. Your works are rich and vibrant, and on a mid-size format so that they can be easily hung or moved around. There is no mistaking one of your paintings for a print ( though I love your wood block pictures ), the paint is so buttery that one can eat it with a spoon. If they don't want that, then what do they want? Have you ever had the experience of quoting a price to someone and they are shocked at the cost? It's as if people don't understand the value of painting. Assumptions of low prices hurt artists (plus it's embarrassing to everyone). Communicating effectively is the only answer I see. But exactly how to do that I'm not sure. It's not like we have a national council like milk or beef. Maybe we should have something analogous. I don't know anything about collecting art. I do know that every home with children should have original art on the wall--and not just prints. There were many nice prints on my parents' walls--and I looked at them a lot. There were three original paintings, though. Two very small ones, done by my mother, and one large canvas, done by a family friend. Three landscapes. The colors, the brush strokes, and the knowledge that a real person had moved a brush loaded with paint across that very surface at one time, gave me access into what a real person saw on one special day in life. I studied, and studied those three paintings my whole childhood. I pondered them the way I absorbed a day in the sunshine. They were somehow a mystery, filled with the fullness of life, and the goodness of God. Why the pink rock in the distance--was that really blue on its underside?? A child's eye sees many things. Let there be art! Very well said! We had original art in our home when I was going up too, and like you I spent a lot of time looking at it.